The Klipsch Image S4i is one of the only non-Apple iPhone headsets on the market that supports both the iPod Shuffle's VoiceOver function and the iPhone 3GS's Voice Control. The Verdict: At just $20 more than Apple's In-Ear headset, the Klipsch Image S4i is a no-brainer, assuming Voice Control and VoiceOver are priorities to you. If they don't matter, or if you've got an older iPhone or non-Apple handset, the choice is less clear. Klipsch's headset is one of the only ones on the market with Apple's VoiceOver-compatible chip—a feature we raised a stink about when it first came out, but which turned out to be alright. As far as 3G Shuffle headphones go, this is about as nice as you're going to get. 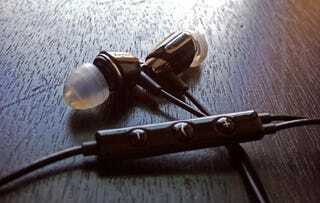 The sound will suit most tastes, but not all: it's extremely clear, and bass is smooth and deep, but never overpowering. Overall the sound reminds me of the V-Moda Vibe Duos—always a reliable standby for better-than-stock iPhone headsets—except slightly more resolved, and less muddy. What this headset doesn't have, though, is the kind of razor-sharp presence that you'd find in headphones like the Shure SE115, or headsets like the (markedly more expensive) Etymotics hf2, or the powerful percussiveness of some of Altec Lansing's UE rebrands. (More on those here.) Isolation and cable movement noise are better than I expected from tips made from rubbery material like this, as is fit: both are excellent, though fans of foam or foam-rubber tips will have to go aftermarket. Zero buttons. That&apos;s as minimalist as it gets. Mic quality is fine, too. The Image S4i's mic sits below your chin, nestled inside the inline controls. It's a natural location, and the headset's buttons, which include volume controls, were easy to find and press, though the whole unit is a little slippery for sweaty exercise fingers. The mic, or its location, probably, gave my voice a boomier sound than I got from the Vibes or the Etymotics, though I remained completely intelligible, and background noises, like the mic bouncing off my shirt, or even a rickety old air conditioner, were very hard to notice on the other end of the line. As a bonus, these headsets work in the headphone jack on Unibody MacBooks, for VoIP use.